KIEV, Ukraine -- During the four years between the unveiling of secret tapes made by a presidential guard in November 2000 that implicated President Leonid Kuchma, the speaker of parliament, and the security forces in the abduction and murder of an opposition journalist and the 17-day Orange Revolution four years later, the Ukrainian opposition mobilized, increased in strength, and improved its tactics to go on and defeat the authorities' presidential candidate, then-Prime Minister Viktor Yanukovych. 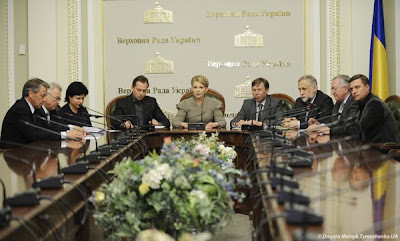 Yulia Tymoshenko (C) leading opposition council meeting. Taras Kuzio is a senior fellow of Ukrainian studies at the University of Toronto and editor of "Ukraine Analyst." The views expressed in this commentary are the author's own and do not necessarily reflect those of RFE/RLwhere this article first appeared.